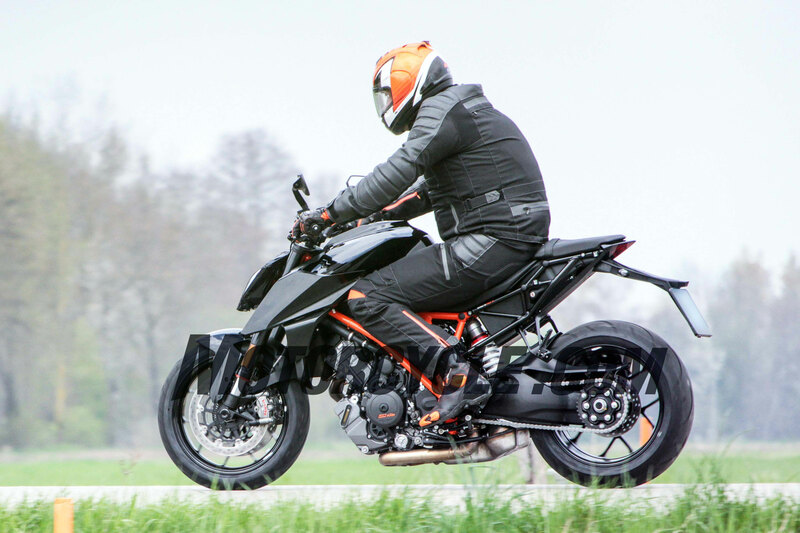 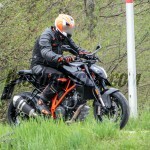 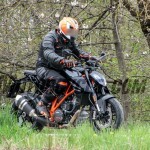 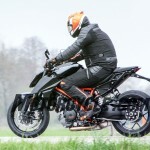 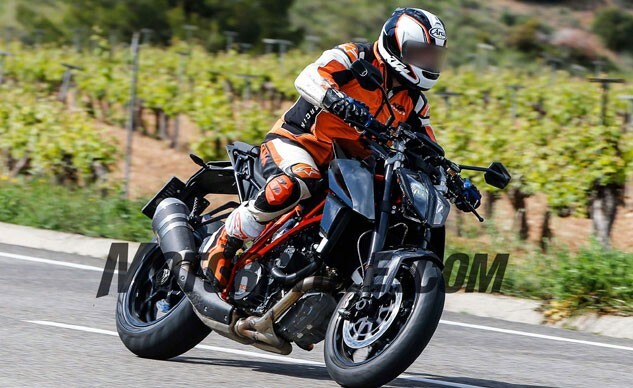 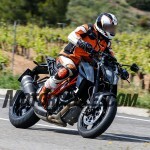 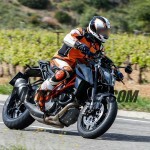 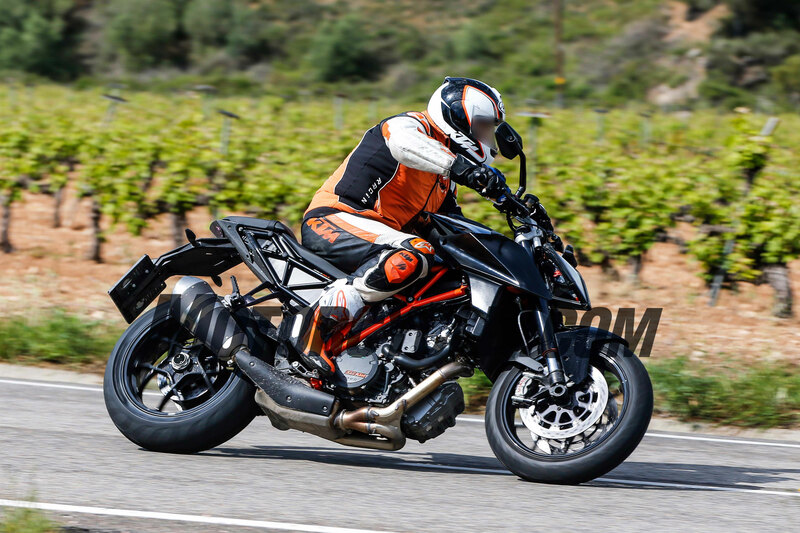 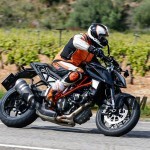 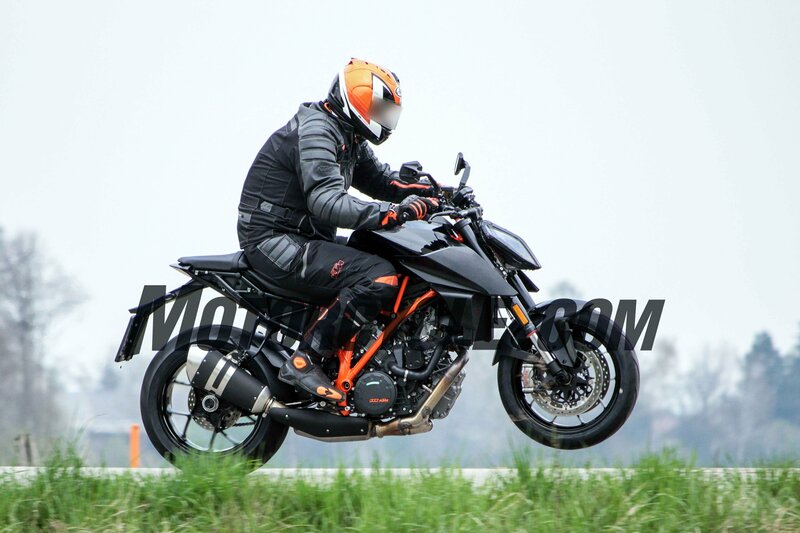 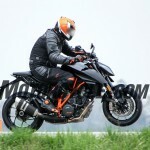 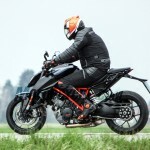 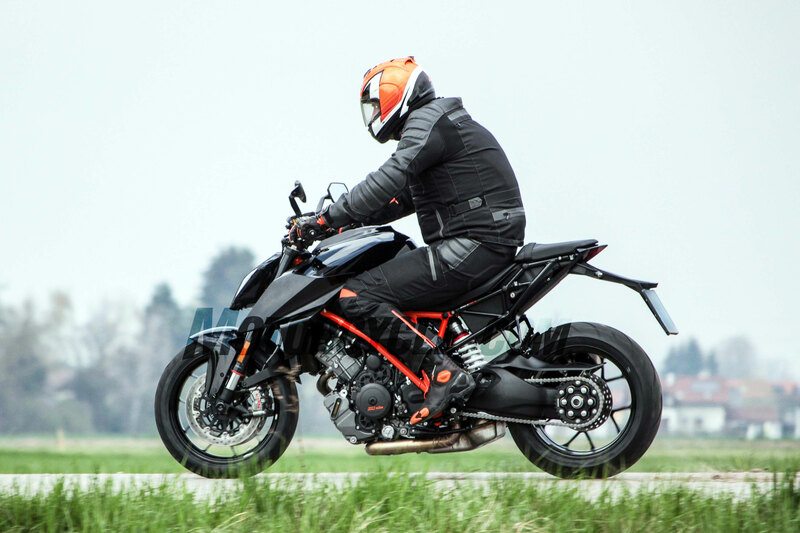 One of our favorite motorcycles is getting a facelift, as spy photos reveal an updated KTM 1290 Super Duke R with revised bodywork and a new LED headlight design. 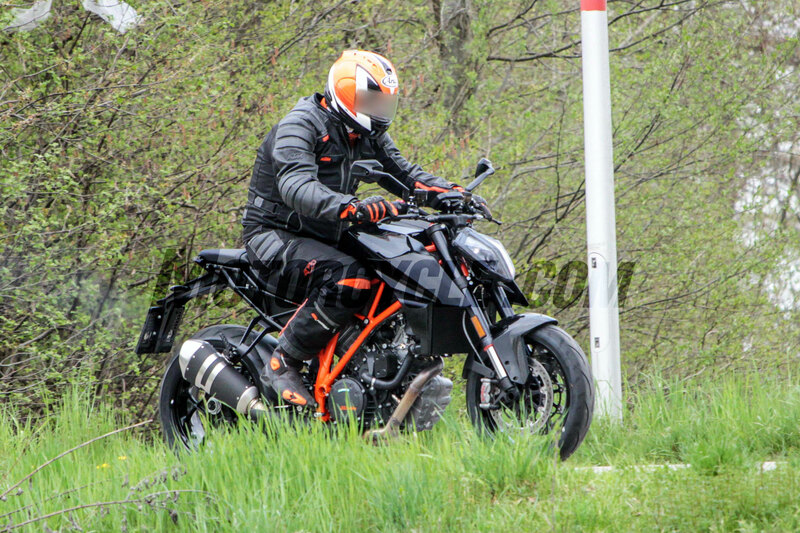 We’ve actually got two sets of spy shots here, one captured near KTM’s headquarters in Austria and another from Spain where the test mule was being tested alongside the current SDR. 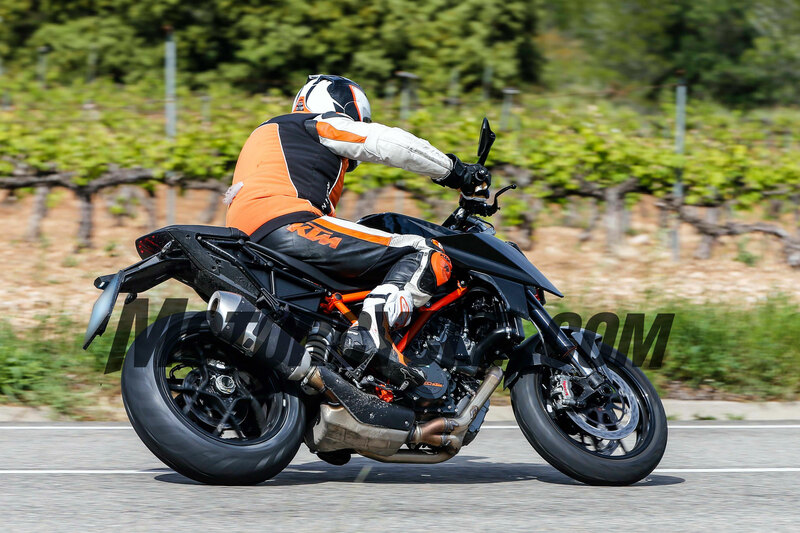 Big torque will continue to be one of the Super Duke’s most attractive features. 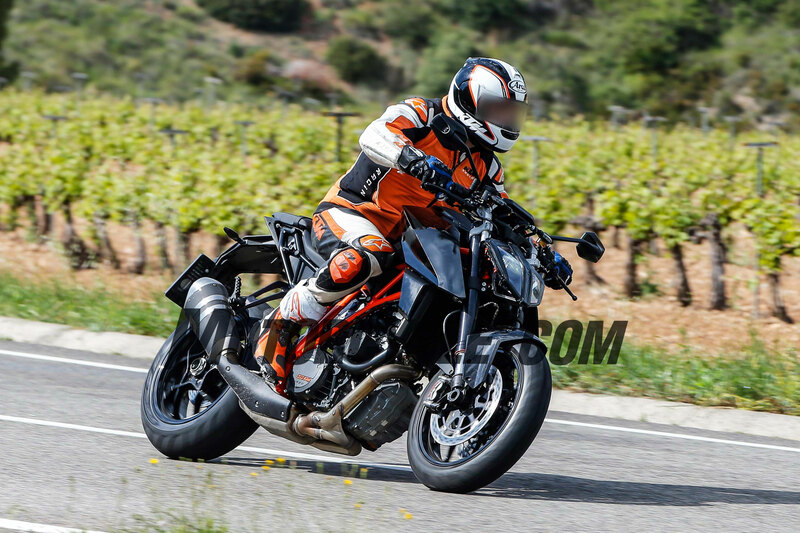 Overlaying the 2016 Super Duke on one of the spy photos, we can see the steel tubular trellis frame and subframe appear unchanged. 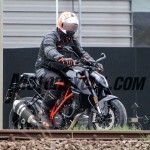 From the exterior, the engine also appears identical, though we can’t rule out any internal changes. 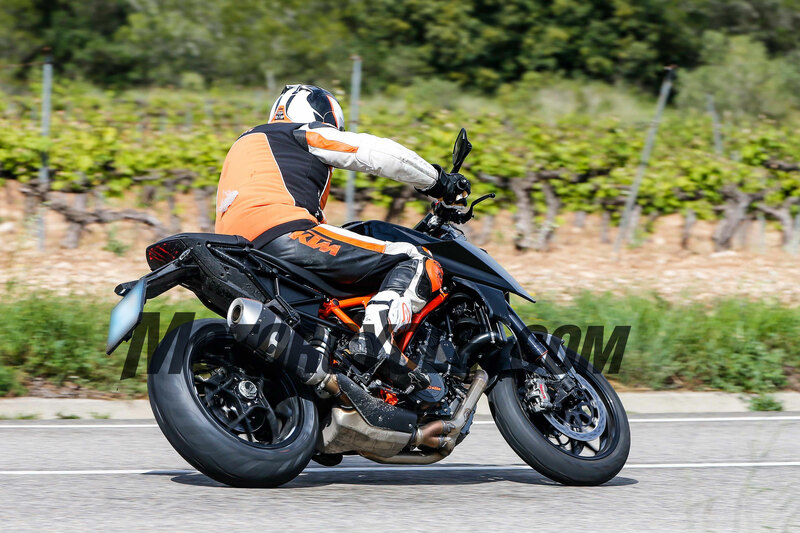 The Super Duke GT engine new for 2016 already meets stringent Euro 4 regulations. 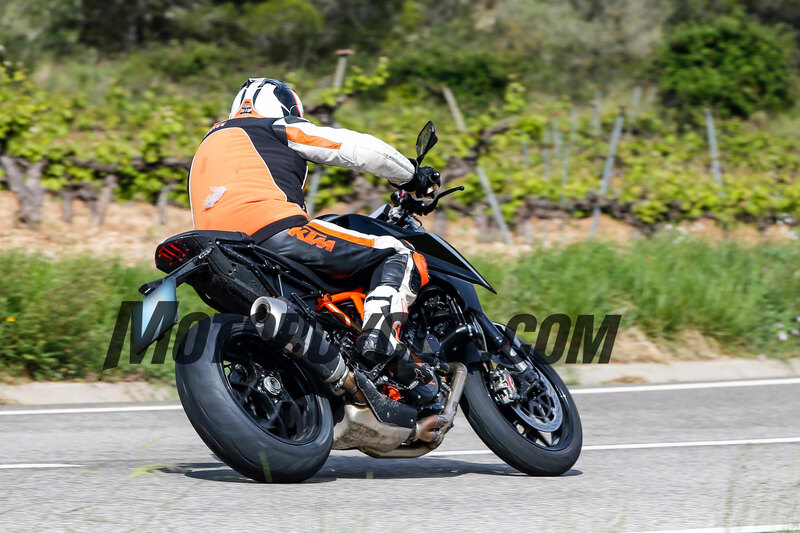 Presumably there will be electronic updates in addition to the Cornering-ABS added to the 2016 SDR. 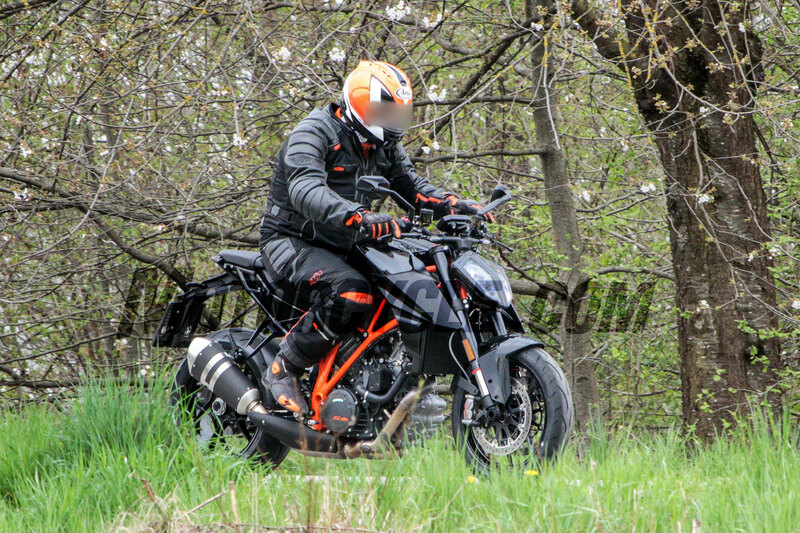 Our mole tells us to expect new ride-mode settings. 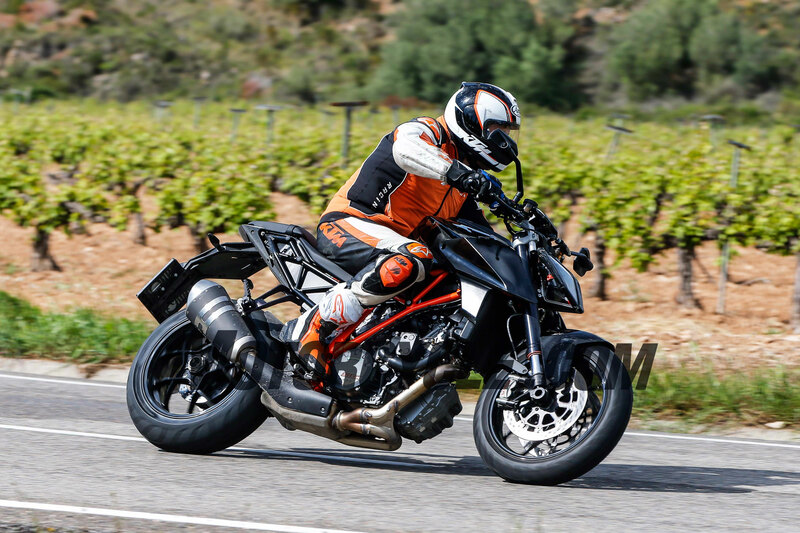 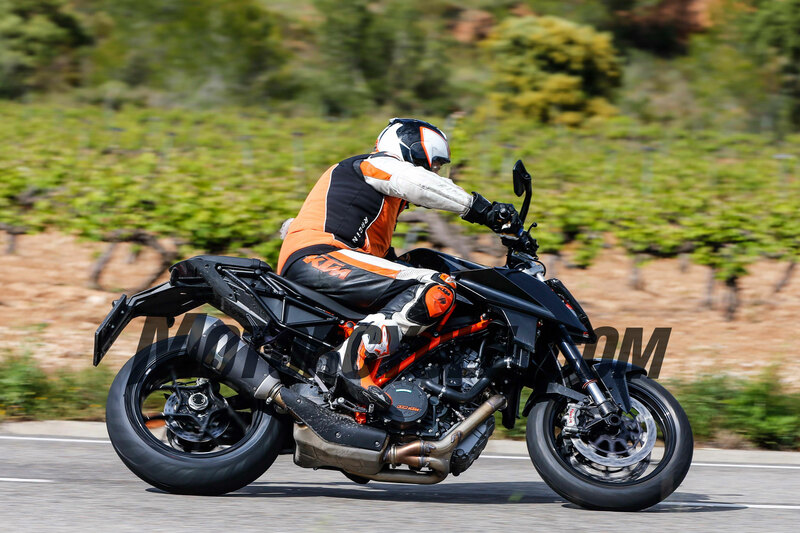 The test bike’s side panels thrust forward aggressively, looking more like the Super Duke GT than the current model. 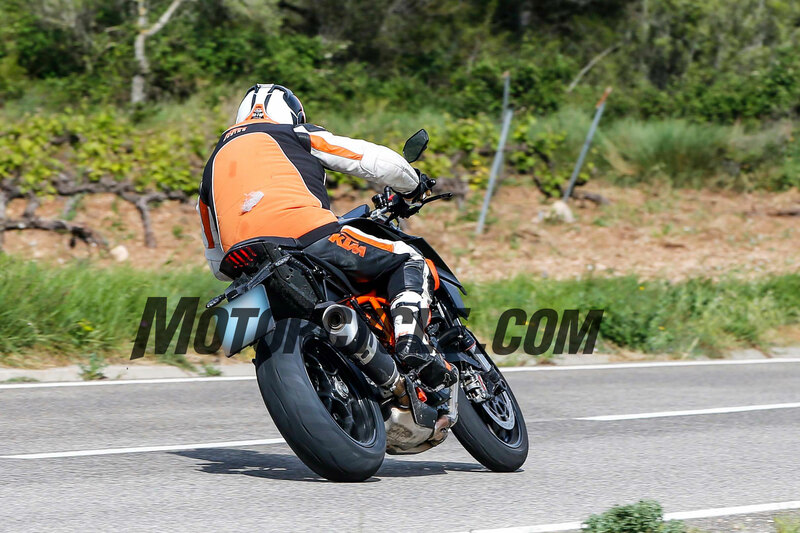 Like the GT, the bodywork also offers more protection for the radiator. 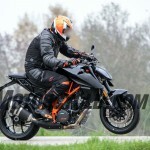 Up front, the new split headlight design is a departure from the stacked design on the current 1290 models. Based on the compact shape, we expect a full LED lighting system. 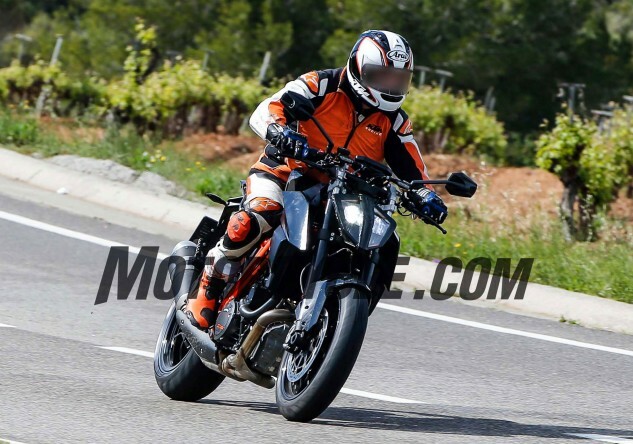 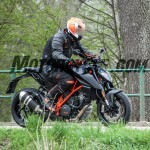 In some of these photos, the headlight is missing a side cover, suggesting KTM is continuing to tinker with it. 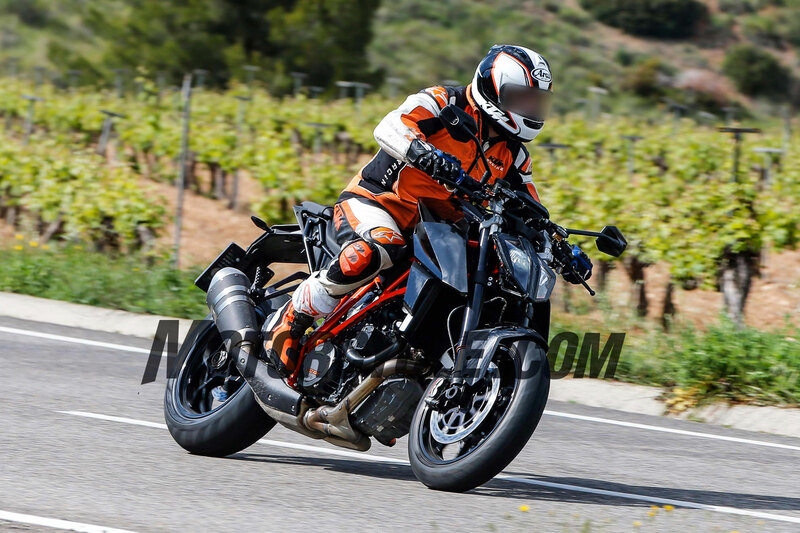 he most striking visual change to the Super Duke is a new LED headlight that significantly shrinks the bike’s nose. 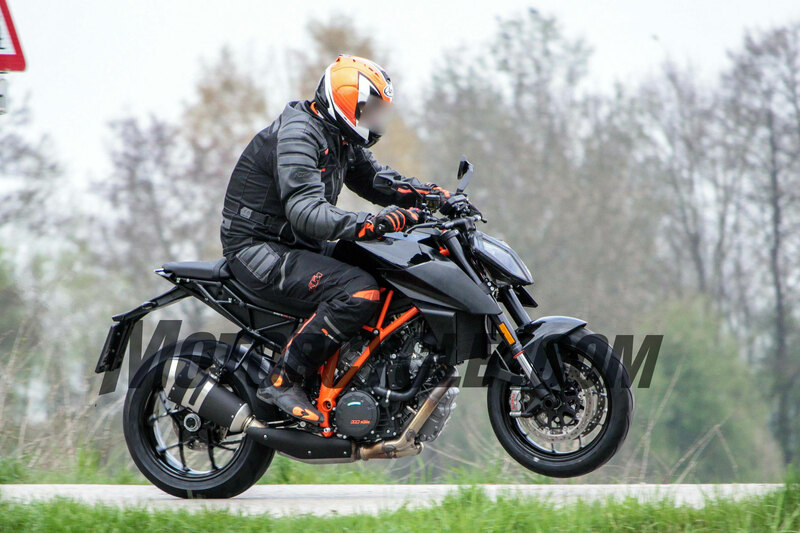 Though we can’t get a clear look at the display, we can see a rectangular instrument panel we’re expecting to be a new full-color TFT instrument cluster replacing the current model’s two LCD screens and analog tach, one of our few complaints about the existing model. 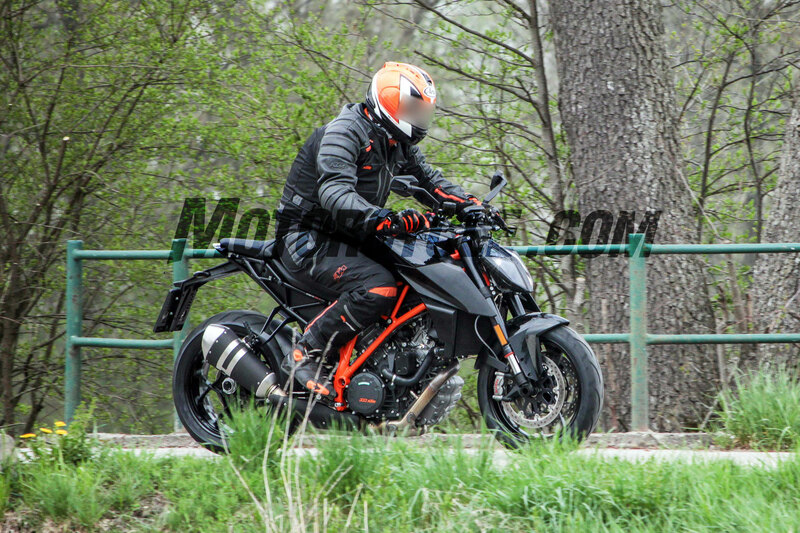 Given the extent of the changes, we expect KTM to reveal the updated 1290 Super Duke R in the fall at either the Intermot or EICMA shows as a 2017 model. 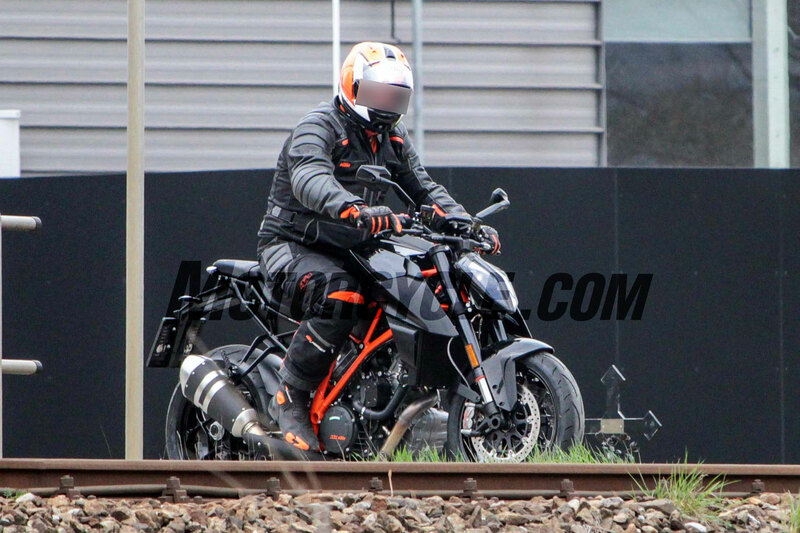 Stay tuned for more information as it emerges. The exhaust system and magical Brembo M50 brake calipers appear to be carry-over items.